Ogre Designer’s Edition — $923,680! 11MAY12 : 1128hrs : The Ogre neutral steers on the command post. A $923,680 count registers. It detects 5,512 friendly infantry nearby. SMILE routine executed. Steve Jackson Games successfully completed its first Kickstarter project just before Noon PDT today. The Ogre Designer’s Edition closed with 5,512 supporters pledging $923,680 in funding. Ogre is officially the highest funded Board & Card Game project on Kickstarter easily beating out the previous, just recently crowned, champion Zombiecide. Ogre reached and exceeded 31 Stretch Goals that brought not just new goodies but early shipping, better packaging, a game assist app, promises of a computer game, restarting the miniatures line, and even doing a future Car Wars Kickstarter project. At times the Stretch Goals seemed crazy out of reach and at other times they were met almost as soon as they were posted. You can see the celebration in Update #36. – The outer shipping carton – about 22″ x 18″ x 4″? – The game box. Currently 21.5” by 17.625” by at least 3.5”. All about 11 x 17, printed 4/4, diecut – right now I count 16 of them. — (3) Maaaybe one w/ hidden buildings. Under discussion. — (4) One with a whole troop of Ogres in a new color. — (5) One, probably, with a new color of Paneuro units. – Rulebook – 24 pages? – Scenario book – 12 pp? Two 19mm acrylic dice, one blue with Combine logo in white, one red with Paneuropean logo in white. All in all an amazing adventure. Is it November yet?! 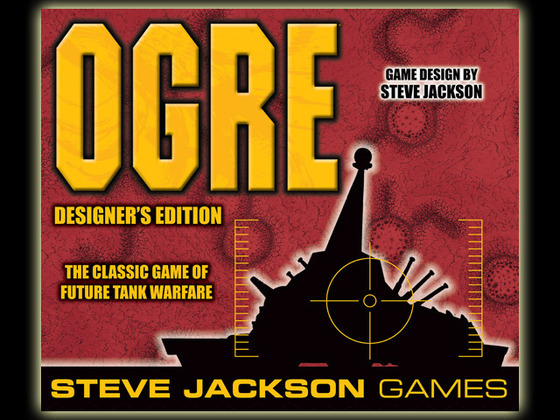 Also see Overheard at Steve Jackson Games Studios, Ogre – A look Back, Ogre Designer’s Edition. 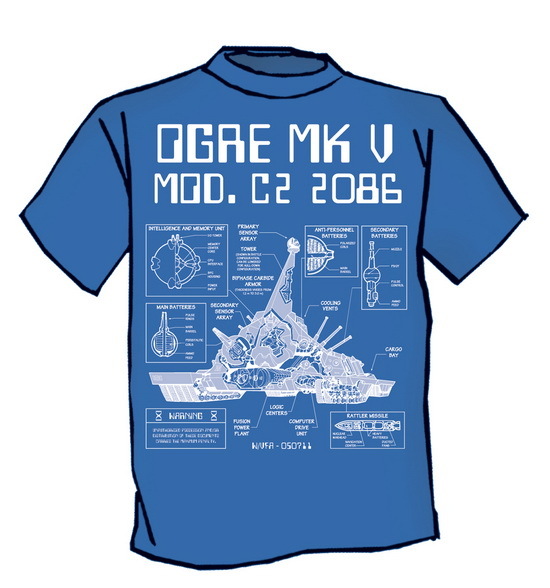 This entry was posted in Board Wargames, News and Updates, Ogre, Sci-Fi. Lets see you missed the third Kickstarter exclusive counterset (also unnamed yet) and the Ogre garage is now vacuum formed heavy plastic. Updated. Thanks! Just boggles the mind….